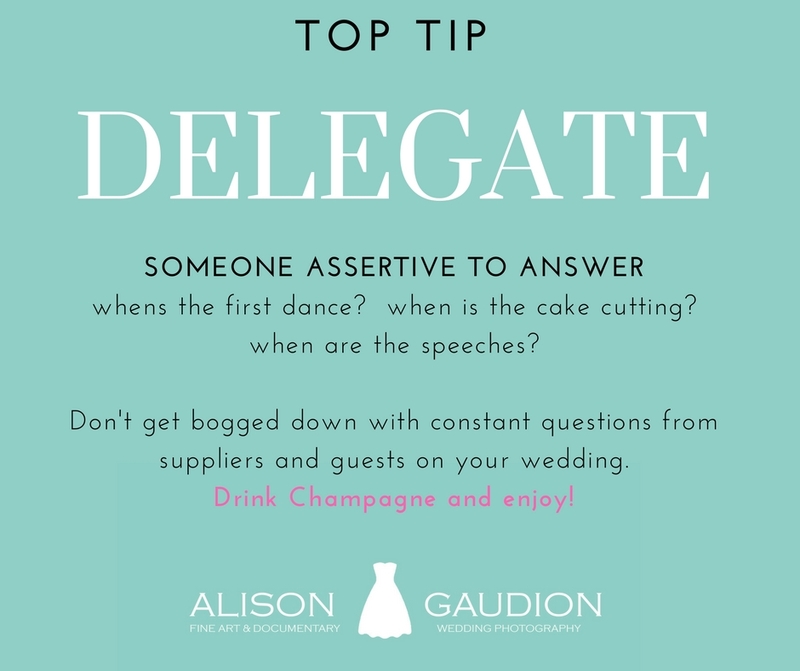 Wedding Tips: Delegate Wedding Coordinator So You Can Drink More! So from time to time, I offer my brides TOP TIPS for their day. It may be something to do with getting ready on the wedding morning, or flowers or rings or venues. Today’s tip is to do with timings! You spend weeks, months, years organising this day. If you do not have someone at the venue who is in charge and going to take charge of the timings, and use their initiative, then the day sometimes goes off piste. The drinks go on too long; the ceremony is late starting, the DJ doesn’t know when to start? I see it all the time, suppliers and caterers constantly ask the bride and groom ON THEIR DAY, what time are you doing speeches? These questions should have already been asked and answered. THEY SHOULD AND USUALLY ALREADY KNOW! Think about it, if you have 3-4 people asking the same question to the bride and groom when they are having drinks and chats with their guests, how bothersome is that – and unnecessary. So, my advice to you is: DELEGATE A WEDDING COORDINATOR! or someone who can run your day. This person should be a sober person, someone responsible, reliable and trustworthy, who can make decisions themselves. You can even give them a clipboard with the timings. This is your GO TO person! In other words, GO TO that person over there as I am going to GO TO the bar and get myself more bubbles. Brides should just enjoy their day; not worry about anything other than having fun and enjoying. Years in the making; years in the paying for and done in about 8 hours usually. Let them drink, let them chat and let them enjoy!